Home › running › Mid Week Catch-up! So yesterday was crazy, and I didn’t pre-write my blog (I often write them the night before to auto-post on the correct day,) so there was no update yesterday! To the three or four of you reading, I apologize for that – I can only imagine the immense levels of disappointment you must have gone through as you patiently waited! Never Fear – here is your weekly catch up! As a bonus, I’ll even include some weekend information! 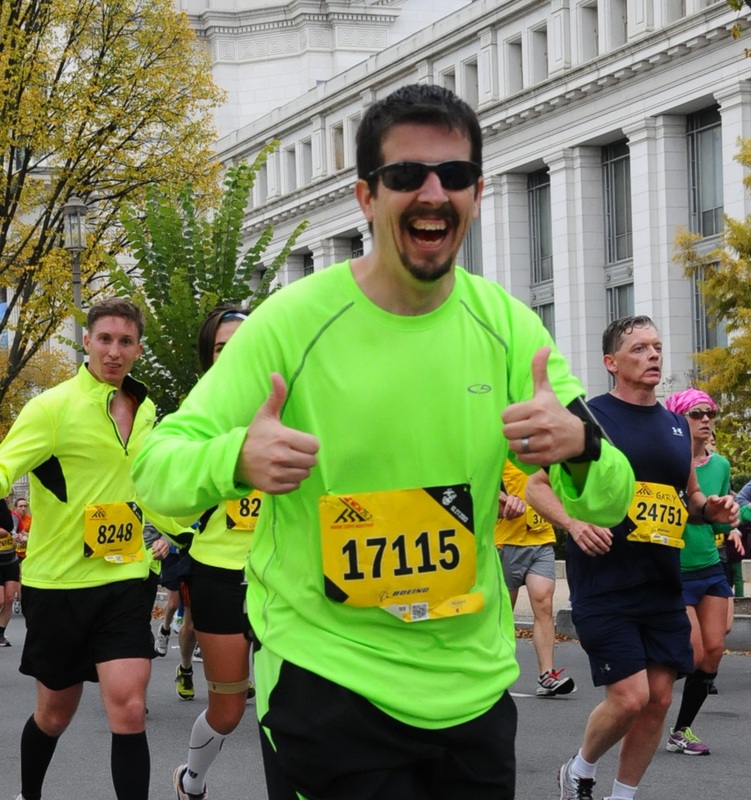 Now looking at the splits, you might wonder what happened at mile 1. The answer is simple – LITTLE JAMES!!! He is a family friend that my children nick-named “Little James.” We knew far to many James’ at the time – and this separated him from the others. It seems that James has started running, and has already reached the mile marker in his progress. Maybe if he keeps it up – I can get him to do a guest-post! My run was nice – as we were still within the 70’s. 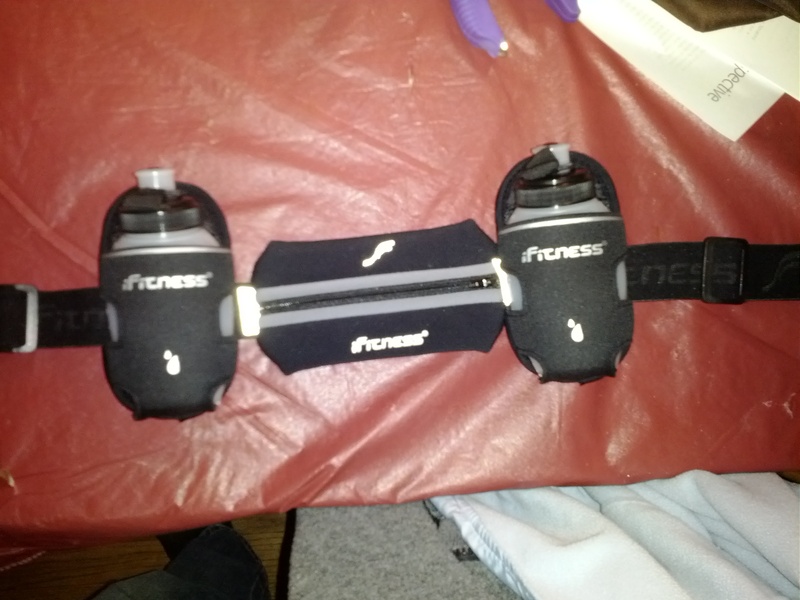 I decided it would be a great time to test out my “hydration pack add-ons” for my ifitness belt. My handheld-water bottle was a bit annoying (although much better than being thirsty) last year, so I decided to look at other options. Since I had won the ifitness belt from Detroit Runner, this seemed the logical way to go. I was torn between the dual 6 oz bottles, or the dual 8 oz bottles, but decided on the smaller size as I thought it would be less noticeable (ie: annoying) while I ran. There is a product review coming soon! Going down the road feeling GOOD! After chit-chatting with James about his running and agony-filled side, I continued on my merry way! Not far before the mile marker for the second mile, I saw a guy just walking down the street playing guitar and singing. He seemed to be having the time of his life – I couldn’t help but smile! Following my run (and shower.. Oddly, my wife insists on my immediately showering after I run.) We went up to visit my Brother, his Girlfriend and his DARLING little girl. She has got to be the cutest niece in the whole wide world! In fact, the following morning – we met up with my parents and my brother’s family for our weekly Saturday morning breakfast! More 2 month old cuteness! Bryce LOVED the Chain-Saw artist! After breakfast we headed up to the MapleFest in Marathon. 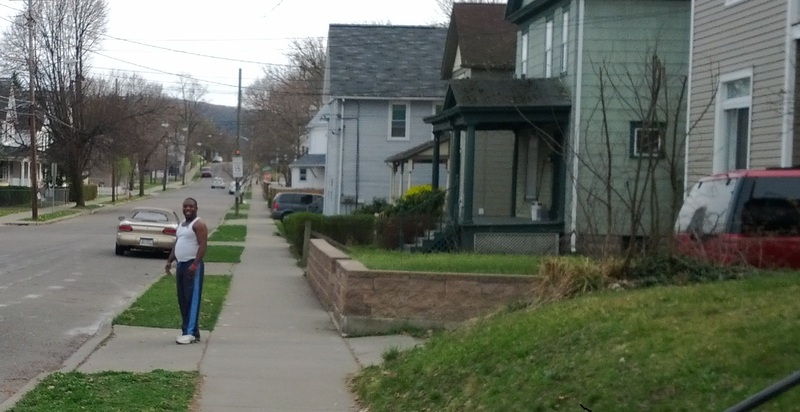 It’s a small town in upstate NY (small enough that it makes Binghamton look big!) They had the obvious things you would expect in a “Maple” fest. Maple Candy, Maple Sundaes, Maple Milk Shakes, Maple lollipops, Maple Syrup making demonstrations, Museum of Maple-Syrup making products, and more Maple-related items! 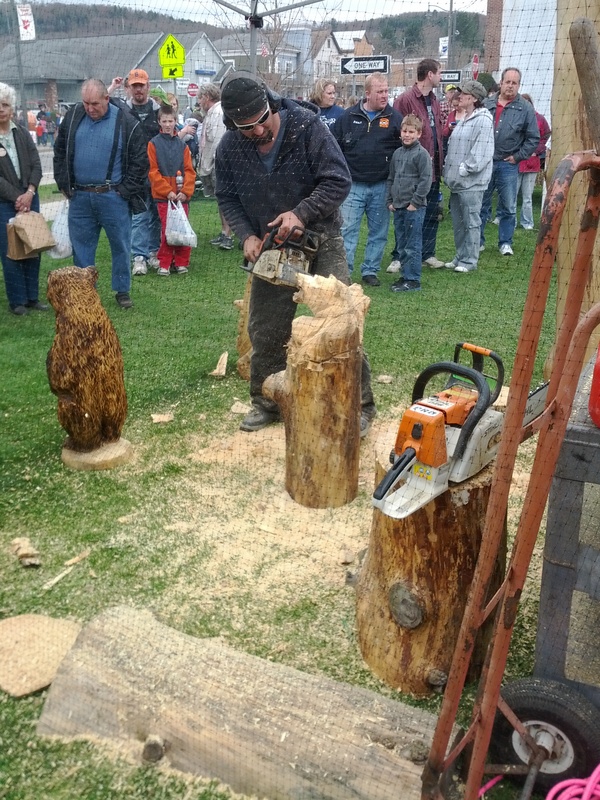 They also had a Chain-saw sculptor, Face Painting, Crafts for Sale, a demonstration from Worthington Kennels on dog-training, a horse-drawn wagon ride, police-dog demonstrations, police-car for children to sit-in and look at, and far more. 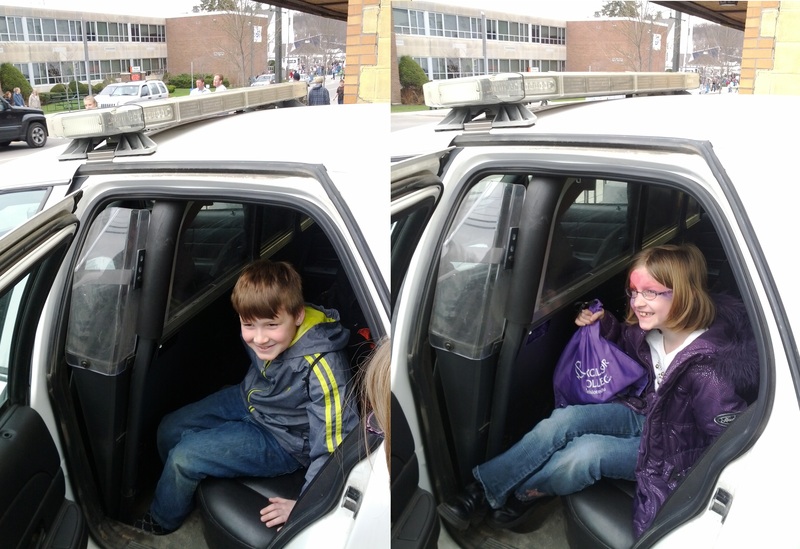 The kids in the back of a police car. Don't they look terrified? trinkets that were available, but they settled on some hand-made wooden toys from a gentleman that has apparently been selling them at the maple-fest for decades. unsurprisingly they both make noise. Sunday was the Chenango Forks 15K, of which you have already read about. Come monday I expected my legs to be in agony. I woke up to sore legs – but nowhere near the inability to walk that I had expected! In fact, after walking around at work – my legs had loosened up and felt good enough to tackle some time on the treadmill. Recalling my previous day’s efforts I set the treadmill to 6.5 mph, and did a 2.5 mile run, followed by a strength training session (Back/Shoulders/Biceps) and an additional 2.5 miles on the treadmill. No problem! With the treadmill run complete – this makes March the longest-mileage month I have ever had! I am pretty excited about that – and it’s not even over! I will let you know what my total is when the month ends! Yesterday My daughter had her stitches out (she had a pilar cyst removed) from her head yesterday, and a giant marshmallow war at cub scouts now has you all caught up! 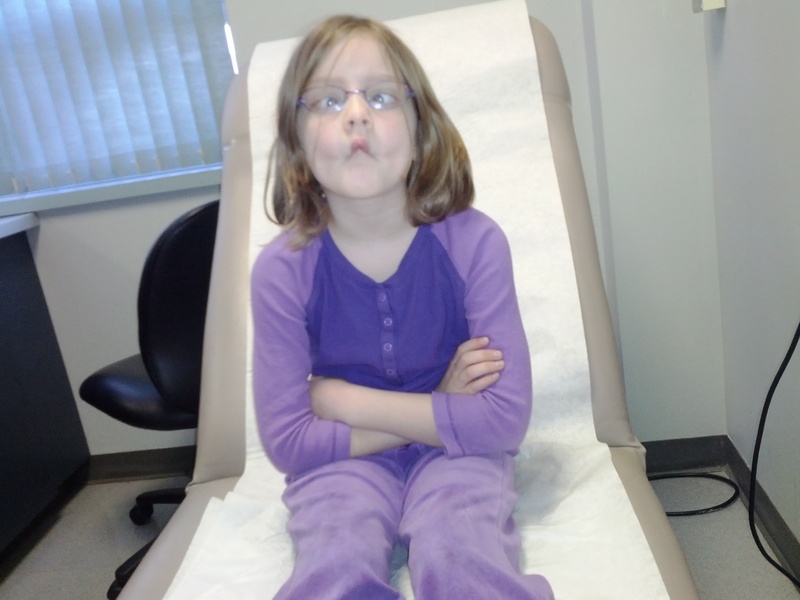 Elspeth waiting for the Doctor to come remove her stitches.